Have you heard all the buzz? 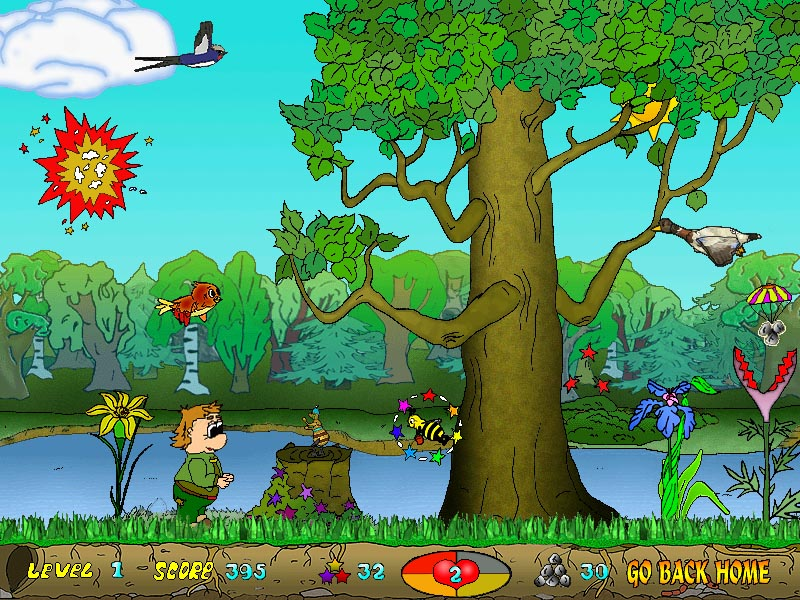 Its about Adventuria  a new and extremely popular non-violent game kids and their parents go crazy about. There is no fighting except for who gets to play first. As developers, we do acknowledge our responsibility for this. The game is so exciting and hip we too started arguing about how much time a day should be allocated to playing Adventuria. Anyhow, just try to be polite and let your grandma and grandpa play as well once in a while. At least for ten minutes or so. The game is very simple and easy to catch on to. The main character is an amiable bee that flies around and pollinates flowers. The number of flowers to pollinate in each level is indicated on the games panel. After all flowers are pollinated, you have to fly back home. As the game progresses, the number of flowers increases. In addition, you will have to protect the plants from evil ants and grasshoppers. Do avoid flying geese and staying too close to the ground. This will drain some of your much needed energy. When flying around, try to collect as many stars as you can. These will get you extra points. One hundred points equal one life. Plus, there are other cool bonuses available later on in the game that will give you extra stones to throw or make you invincible. Games bright cartoon-style animated graphics is the first thing you will notice. It is definitely worth mentioning as is Adventurias catchy tune. You are surely to love the soundtrack and may even start whistling it without noticing. Game controls are very straightforward  press arrow keys to guide the bee and space bar to throw stones. The game is easily installed and requires no complicated setup. All registered users get future updates free of charge. What are you waiting for? Adventuria is now hiring young adventurers. Get started by downloading games FREE trial version immediately!